Laser Walker, from the Japanese Manual. 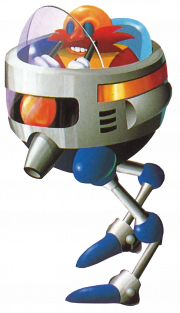 Throughout Sonic Chaos, and in a marked change of his tactics from other early games, our old friend Doctor Robotnik apparently thought himself too important to face Sonic or Tails personally, instead deploying larger, tougher, nastier badniks as boss robots. However, now the animals have infiltrated his final stronghold of Electric Egg Zone, the fat man has nowhere to hide, and finally hauls his obese bulk into battle. The first part of the boss is the Laser Walker, a kind of scaled-down AT-ST Walker which fires bouncing bolts of energy. These are actually quite difficult to dodge, as they persist for a considerable while, ricocheting all over the screen. Robotnik's mecha can take 16 hits before it explodes... but then the mad scientist disengages his Egg-O-Matic and makes a last-ditch effort to ram Sonic to death. The last time he tried that tactic, it didn't work so well; this time, the Doctor's pod is larger, meaner, a lot faster, and will instantly kill you if he hits you regardless of your ring count. However, if you can smack him on the head one more time, Robotnik is defeated. You can in fact get squashed in the left edge and make a hit overflow. 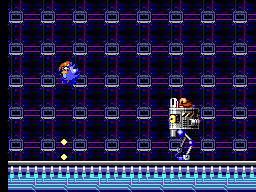 Sonic proceeds to chase the escaping (and surprisingly nimble) human across Electric Egg's metal plates. If you've not collected the five available Chaos Emeralds from the game's Special Stages, Sonic trips over and falls on his face rather embarrassingly, allowing Robotnik to get away. If you have been collecting the gems, the Doctor still escapes aboard a floating platform, but he drops the sixth, red Emerald while doing so. Presumably, reuniting this Emerald with its counterparts stops South Island from sinking into the sea. Hooray for the Good Ending!